The fast casual pizza sector has been taking a slice of the industry. With more than 80 unique, Chipotle-line-service-style concepts emerging in the business, how can a brand stand out? 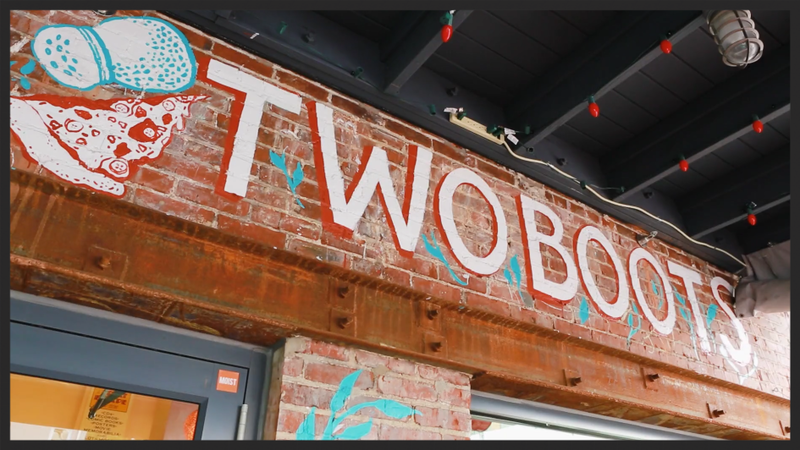 In this episode of "Fast Casual Nation," we visit Two Boots in Nashville and chat with the two big cheeses, Phil Hartman, owner and co-founder, and Sam Boyer, manager of the Nashville location, to see how they set themselves apart. All in the Name: Why Two Boots? Today, Two Boots may be comprised of 16 locations across New York City, Los Angeles, Baltimore, and beyond, but its creation began humbly in the Lower East Side of the Big Apple. Hartman and his business partner opened the first Cajun restaurant in Manhattan. As successful as it was, it was what he called a "Wild West Show" — too crazy. Looking to provide a laid-back but enjoyable dining experience, they came up with a idea where two culinary concepts collided. "We took the Cajun cooking and combined it with pizza and beer, which we really loved. We're called Two Boots because everyone knows Italy is shaped like a boot, but Louisiana, if you're in the right condition when you look at the map, also looks like a boot. Like an old work boot. That's our 'Two Boots,'" Hartman said. "We combined Italy and Louisiana...the two best cuisines in the world, as far as we're concerned." While most fast casual pizza brands are all about the personal pizza, Two Boots does not focus on customization as much as it does the "whole pizza pie" experience. The brand comes up with unique and quirky combinations, like Hattie B's medium-level heat chicken with housemade ricotta cheese, or the "V for Vegan" pizza, featuring red pepper and basil pesto. All pizzas have a cornmeal crust, which offer a different, white-gold texture and a nutty crunch. Like their interesting flavors, the pizzas are named after just-as-interesting icons. But why does Two Boots take this approach? Hartman believes it's not a true pizza-eating experience if a group of friends aren't sharing a single pie. And Nashville Manager Sam Boyer had his views on offering a few creative pizzas as opposed to complete customer customization. "I don't know, it takes away from the experience, I think, And it can also be kind of disastrous when you give folks a big menu," Boyer said. "There's something to be said about having professionals who tinker with the pizzas, who spend hours tasting it...coming up with the optimal ingredients for it and the toppings." Watch the full episode now and step into the shoes of Two Boots! Is the Craft Beer Movement Losing Steam?